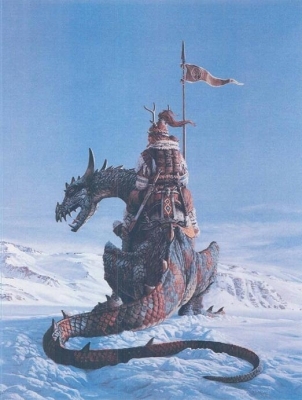 Frost Drake and a Priest of Helm enjoying the scenery of the icy plains of Dragonia. Frost Drakes are NOT dragons, but they are wingless dragonkin inhabiting the numbing cold of the land of eternal winter – Dragonia. At birth, they are 1 HD creatures and as they grow, they usually stop at 10 HD at about the age of 200 – 300 (unless they bond with priests or paladins of Helm, in which case they can potentially grow to be 20 HD creatures). Breath Weapon 2d6 cone of frost 70′ long, 5′ wide at base, 25′ wide at end. Non magical metal weapons save vs magical cold (DC 26) or crumble upon next impact. Claw 1d6+1 at 3HD, 1d6+2 at 5HD 1d6+3 at 7HD etc. Bite 2d8+1 at 3HD, +2 at 5HD +3 at 7HD etc. Breath Weapon 2d6+1 at 3HD, +2 at 5HD +3 at 7HD etc. Rear kick 1d8 dmg+1 at 3HD, +2 at 5HD +3 at 7HD etc. Tail Slap 2d6 dmg+1 at 3HD, +2 at 5HD +3 at 7HD etc.